See that link at the top of the left sidebar that shows a series of DVDs on Homemaking Skills? You should click on it. Not because I said to, though, but because of what it will do for YOU! It is a direct link to a DVD called Homemaking 101, created by Family Vision Films. I have borrowed it from my neighbor, who is also a homemaker. I will definitely be buying my own copy! It is just TOO sweet! Not only is the voice of the homemaker on the DVD soothing and calming, so calming that your children will love listening and watching along with you, but it is FULL of tips and helpful hints! And there are even a few recipes! 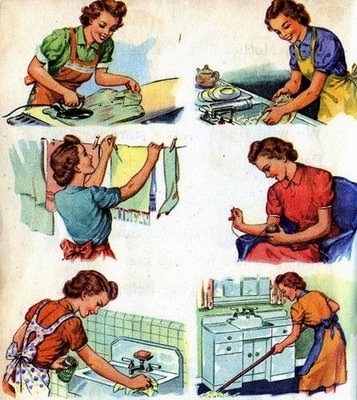 Interspersed within the homemaking tips are Scripture verses to remember as well as wisdom from an older Titus 2 woman! And there are bonuses on the DVD, too! I could watch this video every morning before my children wake up--and I may do just that! It is inspiring, gets me in the right mindset to doing the work of my home, and puts in my heart the right tone to use with my children. I simply love it. Get your copy today! It will bless you like it has blessed me! And be sure to share it with a friend or neighbor, so she can be encouraged as well! I did not receive any free product or compensation to share this product with you. Along with my honest review of a product I have personally used, this post directs you to an affiliate link. Thank you for supporting this blog and our family by purchasing through my links! Thank you, Melissa! Such a sweet review, I feel so undeserving. You're too kind, may our efforts bring Him glory!